MEASUREMENTS : 5.5''H x 2.5''D. STEEL CALL BELL: Delivers A Loud Clear Ring For Those Who Are Bed Ridden and May Need Assistance. SPRING WITH METAL BALL: Offers A Clear Crisp Ring! USES INCLUDE: Signal Dinner Is Ready, Train Pets, Call Order In A Room, Use In Games, Call For Help. COLOR: Silver Tone with Black Handle. THIS OPTION IS FOR: 10 Pcs. Bell Set. MEASUREMENTS : 5.5''H x 2.5''D. 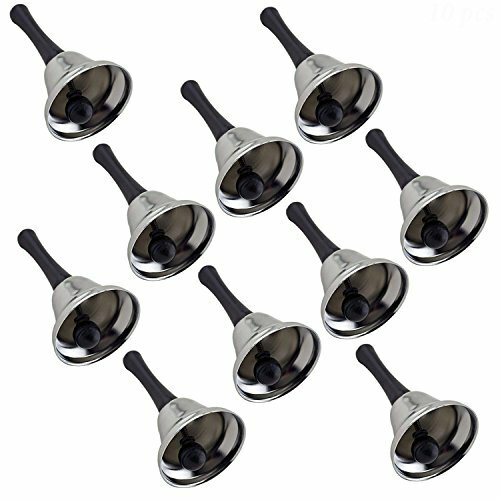 STEEL CALL BELL: Delivers A Loud Clear Ring For Those Who Are Bed Ridden and May Need Assistance. SPRING WITH METAL BALL: Offers A Clear Crisp Ring! USES INCLUDE: Signal Dinner Is Ready, Train Pets, Call Order In A Room, Use In Games, Call For Help. COLOR: Silver Tone with Black Handle.